York County, Pennsylvania York County, Pennsylvania U-Pick farms: Find a pick your own farm near you in York County, Pennsylvania for fruit, vegetables, pumpkins, organic foods,local produce and more! Looking for a local, pick-your-own farm in York County, Pennsylvania? Scroll down this page and you will see the U-Pick farms in York County, Pennsylvania, sorted by county. Those that offer organic or sustainably grown produce are identified by the words "organic" and/or "sustainable" in Green, next to their name (see "What does Organic mean?"). The U-pick crops they offer follow the name of the farm. To search the page for a specific crop, use Ctrl-F (or on an ipad or Mac, use their "search on this page" function) If they have a website, the name will be in blue and underlined; click on it and it will open their website. If you find anything outdated or inaccurate, see the customer and farmer menus (as appropriate) at the top menu bar to submit updates and corrections and help me keep each current! Remember to always check with the farm's own website or facebook page before you go - or call or email them if they don't have a website or Facebook page. Conditions at the farms and crops can change literally overnight, so if you want to avoid a wasted trip out there - check with the farm directly before you go! And if you know of any farms I missed and want to add a farm, please let me know! I'm making updates for this year as fast as I can - if you find anything out-of-date, wrong or not working - please let me know! 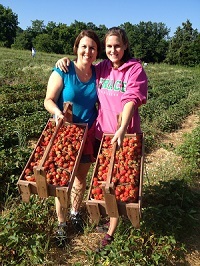 Comments from a visitor on June 06, 2011: "This is my second year of picking at Barefoot Farms. It's a beautiful off the road family farm that has friendly accommodating owners and very reasonable prices. Great amount of delicious strawberries, which is my personal favorite to pick there. I always feel welcome (and full!) when I come to barefoot farms. Great way to spend the day with my family. Look forward to it every year!" Comments from a visitor on July 15, 2009: "People are friendly. They assign you to bushes & the berries are HUGE!" Comments from a visitor on November 25, 2008: "when we lived in the Loganville area , we went there every Sunday. now not so much longer in the area and we miss it. we loved it . it is a orchard and farm. fresh fruits and veggies are available. cider in the fall is always fresh and delicious! summer time entertainment and ice-cream is a sweet treat. shops and deli style food is a great way to fill the empty tank and not spend to much!!!!!! - all around fun-filled, family fun. great way to spend a Sunday afternoon! highly recommend. please include on your list, this one should not be overlooked and forgotten. They added the pavilion with stage. there they provide entertainment in summer. whatever the season,(peaches) ex.... sundays are served. yumm, picnic tables under the pavilion area. flowers and green house in spring make for a great inspiration . oh and how can we forget the homemade bake goods." 4591 Beards School Rd, Spring Grove, PA 17362. .
A visitor comments: "Very family friendly. Clean fields. Friendly staff. " Comments from a visitor on June 06, 2009: "The people who run the orchard are very nice and helpful. I picked apples every week with my kids during the fall. My husband picked up bushels of apples for his office. During strawberry picking season already picked strawberries can be purchased. In the fall they sell apples, hay bales, corn stalks, gourds and more. A bathroom is available to the public. It's a kid friendly place. " Raven's Berry Farm - blueberries, We use zero pesticides. A visitor says: "They don't have alot of things to do but they have the best variety and tasting peaches and apples." 3121 Norrisville Road, White Hall, MD 21161.